The November talk will be given by Prof. Richard Crowther, Chief Engineer at the UK Space Agency. He will be talking about his work focussing on managing our shared use of space. The Inter-Agency Space Debris Coordination Committee (IADC) is an international governmental forum for the worldwide coordination of activities related to the issues of man-made and natural debris in space. The Committee on the Peaceful Uses of Outer Space was set up by the General Assembly in 1959 ( resolution 1472 (XIV)) to review the scope of international cooperation in peaceful uses of outer space, to devise programmes in this field to be undertaken under United Nations auspices, to encourage continued research and the dissemination of information on outer space matters, and to study legal problems arising from the exploration of outer space. Richard grew-up in Salisbury and attended Bishop Wordsworth’s School. 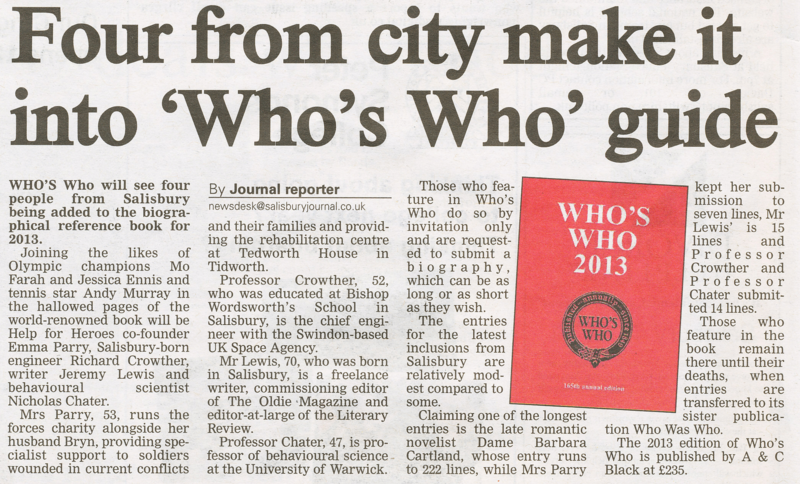 He is also one of only four people from Salisbury to make it into the 2013 edition of Who’s Who (as reported by the Salisbury Journal, December 4th 2012).